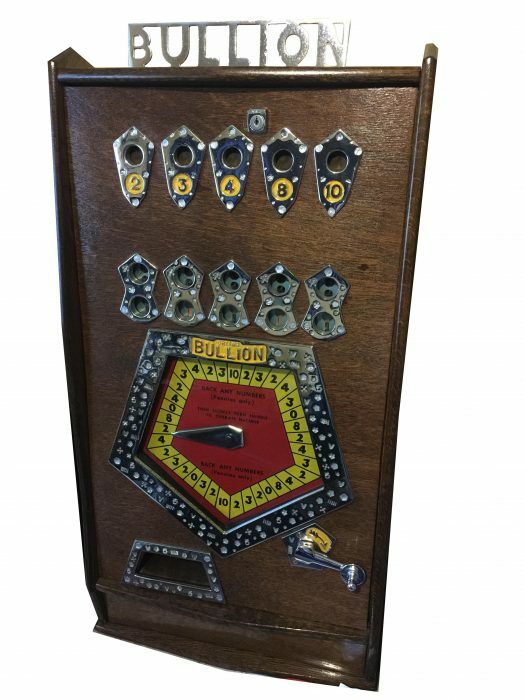 The Bullion was the last all-mechanical incarnation of a type of gambling machine which predates the one arm bandit or three reeler. The first of the kind were large floor-standing, American-made games from before the turn of the century, with colourful roulette style wheels upon which you placed your bets. Later, less elaborate, counter-top versions (particularly the Caille Commercial) were common in British arcades, but were mostly worn out by the 1960s. With its five-way bets and robust, reliable mechanism, the Bullion filled a gap. The original Commercials had a maximum payout of 20D, against the Bullion's 12D (or 10p) which also introduced four no-win (zero) positions on the dial. The percentage returns were not bad though, thanks to the two twelve and three eight positions.